On Good Friday 2003, it was past midnight, I was clearing myself with the most intensive LOVE I was able to. All of a sudden, a heavy pain in the lower back left me, and then I felt motion in all of my chakras, in my whole body. 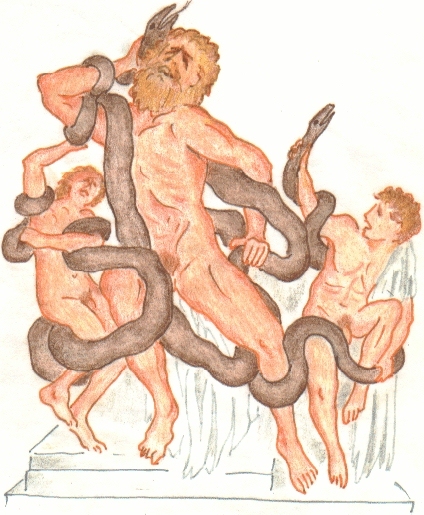 At last I perceived long snakes, as large as the material snakes we know, crawling out of my chakras... and spontaneously I thought of the famous Greek statue of Laokoon and his two sons being strangled by two snakes. After having overcome my first surprise and having watched this for a while, I asked what this meant. And I learned that these snakes represented the 7 Bonds of Mankind. They are bonds or ties, because the characteristics, or the patterns of thinking and behaving that these snakes were symbolizing, are tying Humanity to the material world, stifling any spiritual advancement. And GOD led those beings into LIGHT, in a symbolic action, in which I consciously acted as a representative for all Mankind. And I KNEW that these beings will lose their power by and by, until they will disappear for good. On a Higher Level, HE simultaneously created a sort of energetic 'net pattern', a 'blueprint', as a support for all of you to free yourselves from these powers as well in the meantime, and it will be much easier for you than it was for me! Altogether, it took about three days until those beings had gone into LIGHT. LIGHT does not know 'sin'. When I was told about my incarnation as 'EVE', GOD said, there is no 'sin', so of course there are no 'original sin' and no 'mortal sin' either! HEAVEN knows no hell and no purgatory. GOD will not punish and HE will not take revenge - GOD is nothing but LOVE. Those are and were human ERRORS, misused as instruments of suppression, to keep MEN small and dependent. Each MAN, no matter what he has done in the past, can decide NOW to turn back to LIGHT, and GOD-GODDESS, FATHER-MOTHER will welcome their 'lost son', their lost daughter with open arms!